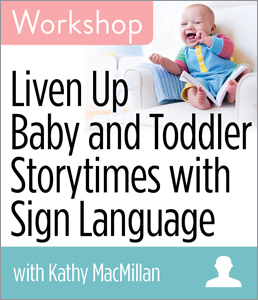 CHICAGO—ALA Publishing eLearning Solutions announces a new session of our popular workshop, Liven Up Baby and Toddler Storytimes with Sign Language with Kathy MacMillan. This workshop will last 90 minutes and take place at 2:30pm Eastern/1:30pm Central/12:30pm Mountain/11:30am Pacific on Thursday, March 28, 2019. Signing with young children of any hearing ability fosters bonding, stimulates language development, and reduces frustration for caregiver and child. Learn how to use sign language in storytimes to broaden their appeal and make them more participative. In this interactive workshop, Kathy MacMillan—American Sign Language (ASL) interpreter, librarian, and storyteller—will use video examples to provide easy-to-learn signs that can be retaught and incorporated into stories, rhymes, and songs. You will be able to use the skills learned in this workshop to create programs that will help you, your staff, and parents communicate better with children.